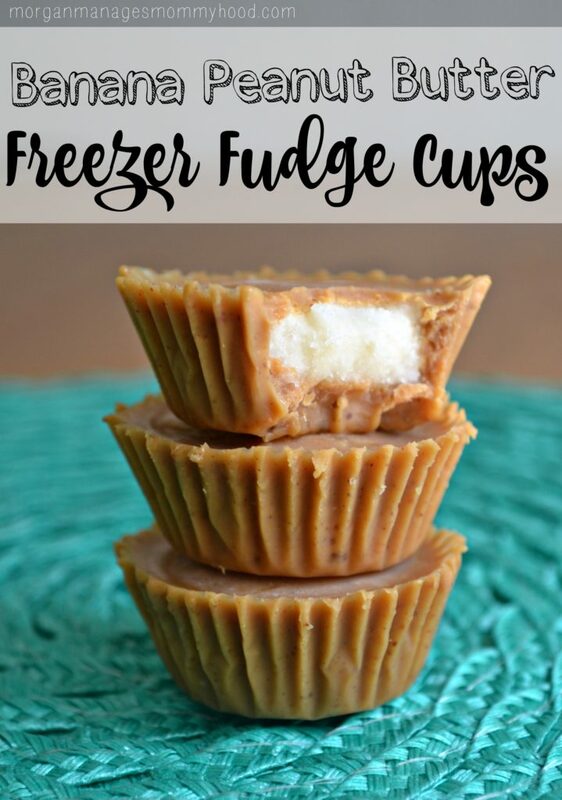 These freezer fudge cups are completely customizable and can be sugar-free if you choose! 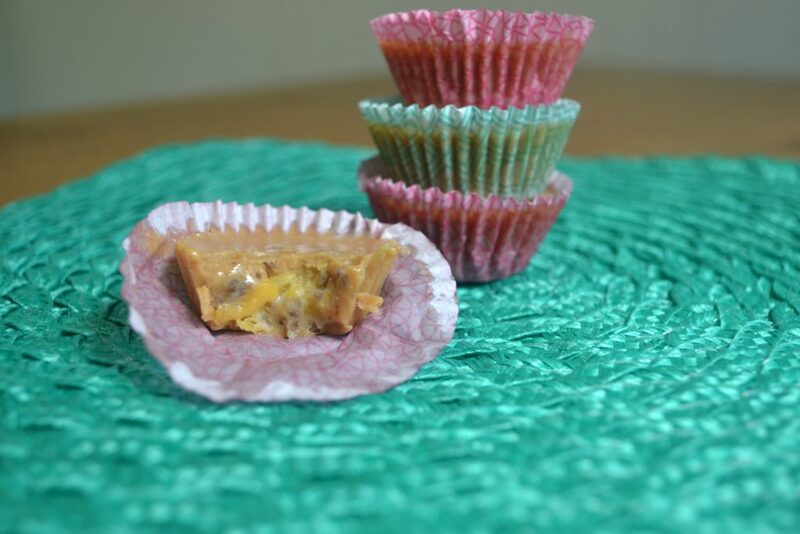 Read on to learn how to make these tasty treats! So it happened – or, I should say, it’s been confirmed. My body does not like something about sugar. Like at all. Backstory – I’ve been a sugar addict my entire life and never really saw a problem with it. (besides to obvious issues of uhh, you probably shouldn’t eat that much sugar…) When I was sick as a kid I remember putting so much sugar and honey into my tea that it was syrupy, which was what I wanted. And when I would go to Dunkin’ Donuts after school in high school I would order a large French vanilla iced coffee, light and extra sweet – I wanted to crunch of the coffee soaked sugar crystals with each sip. I could eat sweets with or even as every single meal and be a happy, happy lady. I read somewhere that sugar could be related to eczema issues. I’ve mentioned a few times that I have horrible, horrible eczema that is just getting worse and worse, so I decided to take a chance and cut out sugar. And it sucked for a bit, (withdrawal, you guys! From sugar!) but then my eczema started to clear! Spots that I had had for almost a year were slowly fading. And I tried to convince myself that it was the weather – it all started around the same time it started to get warm, and dry winter air can cause eczema in many. But then over Mother’s Day weekend I enjoyed my fair share of sugary ice cream and by Monday, I was scratching my skin off. Womp womp womppppp. So now I’m trying to navigate a path of no sugar which is difficult, to say the least. While I do plan on occasionally risking it and eating something tasty, it’s obvious that for now sugar and I are just not friends. So what’s a sweets lover to do when she can’t have the good stuff? Substitute, of course! 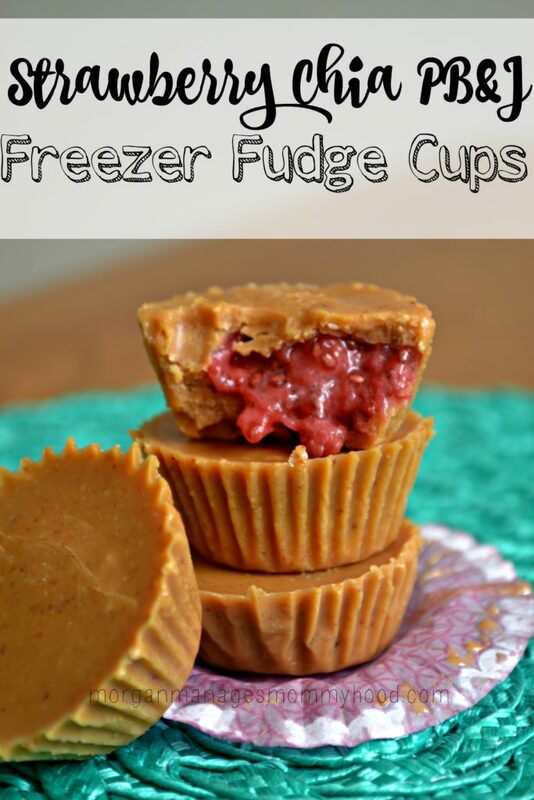 On my search to find something delicious and “safe” for my skin, I came up with these fun freezer fudge cups. They’re super customizable, but below you’ll find 3 ways to whip ’em up and serve as inspiration! Cook the berries until soft and mush with a fork. Add in chia seeds, sweetener if using, and coconut oil, stirring well to combine. All of the coconut oil won’t incorporate, but that’s fine. If you think it’s needed, add a bit more water or chia seeds depending on how wet your berries were. 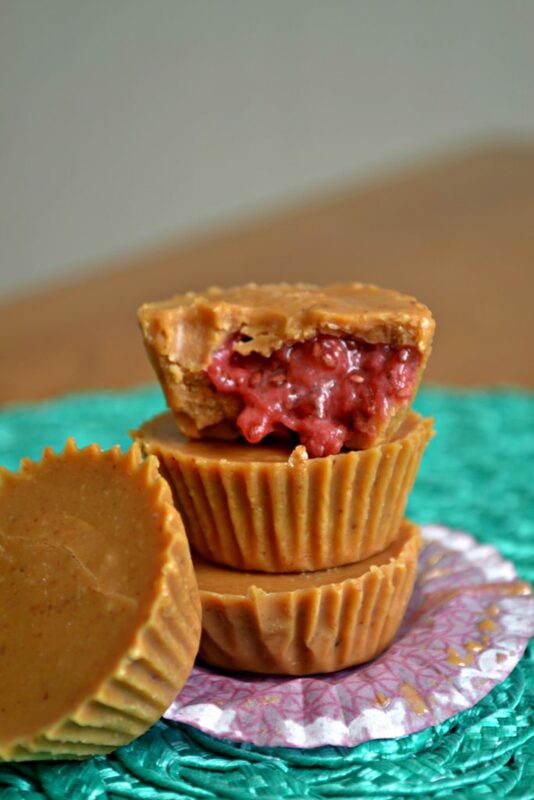 Using mini muffin paper wrappers*, spoonable 1/2 TBS of the peanut butter mixture into each cup (I usually get about 10 total), then 1 scant teaspoon of your chia jam. Top with about 1/2 TBS of the peanut butter and put into the freezer to harden, at least 30 minutes. The jam cups right out of the freezer will be a little hard – the jam freezes more solid than the nut butter due to the liquid in the fruit. Either store them in the freezer and allow to sit out a few minutes before enjoying OR store them in the fridge. If storing in the fridge the jam will be a perfect consistency, but the nut butter layers will melt pretty quickly, so you have to enjoy fresh from the fridge. Slice your banana into between 1/4 and 1/2 thick slices. Optional: omit the sweetener from the PB mix and put a very thin layer of honey onto the banana slice. It’s good, trust me. Cook the peaches until soft and mush with a fork. Add in chia seeds, sweetener if using, and coconut oil, stirring well to combine. All of the coconut oil won’t incorporate, but that’s fine. If you think it’s needed, add a bit more water or chia seeds depending on how wet your peaches were. Using mini muffin paper wrappers*, spoonable 1/2 TBS of the almond butter mixture into each cup (I usually get about 10 total), then 1 scant teaspoon of your chia jam. Top with about 1/2 TBS of the almond butter and put into the freezer to harden, at least 30 minutes. *You can use whatever sweetness you enjoy – right now I’m using about 1/4 tsp because I’m trying to reduce natural sugars as well to see how that helps me, but in the past, I’ve used up to 1 TBS. Both honey and maple syrup work very well here. *I experimented by using paper cupcake liners and was SHOCKED that they worked perfectly without any kind of preparation. Here I used some Wilton mini cups that I found on clearance at Target and they were the perfect size for a little treat. I also didn’t place them in a tin, just laid out the unsupported liners on a tray and they held their shape just fine. You can also use silicone molds, a cupcake mold, or an ice cube tray. So have you ever struggled with a food allergy? Any tips for going sugar-free? What nut butter and fruit combination do you want to try? Let me know in the comments! oh wow this looks really good! Did you use mini muffin cups? I used to eat so much sugar too. I’ve found that since I’ve really limited it, I break out less. Wow! this looks soooo good!!!! I need to try these. I try to limit my sweets too. I’ll try to not eat them during the week and have a few over the weekend. Yum! I want to try and cut down a litttttle bit on sugar. My diet is pretty restricted by allergies, but I know I could do with less anyway, and I’ve been trying to cut back when I bake. The problem is, when I bake, I want my boyfriend and my family to enjoy the treats I make, and their palates taste way less sweetness than I do naturally, so they want the sugar! These sound great, Morgan! Put nut butter in anything and you’ve got my attention 😉 I’ve been going a little sugar-crazy lately, and my stomach is not liking it, so I’m trying to focus a little more on fresher foods! That is really cool how you were able to stuff it with other things. These look awesome! I also suffer from eczema and notice a difference when I consume a lot of sugar. So I’ll be trying these for sure! They all look so delish! But those peanut butter and banana cups are calling my name! Yum! I need these in my life, STAT! OMG I’m hungry now! These look so yummy and easy to make! Love the peanut butter one! Will totally give it a try. It’s a bummer that sugar is such an issue but there is a positive! At least you’ve worked out what seems to cause you trouble! I have DEFINITELY struggled with allergies and intolerances. Let’s just say it’s easier to least what I CAN eat versus what I can’t, haha! I notice a huge difference in how I feel when I cut out or limit sugar also. I make these bars ( http://seriously-lovely.blogspot.com/2015/08/banana-walnut-raisin-chocolate-chip-bars.html?m=1 ) a lot to have a healthy snack to enjoy. You could easily omit the chocolate chips to make them completely refined sugar free. I think the PB&J Cups sound delicious! Isn’t it crazy how something that’s in, uhh, everything can make so many people feel icky? Thanks for sharing those bars, I need to check em out! With your little ones, how do you find the time to create such amazing recipes and photos??!! These fudge cups look fab, and a perfect dessert to make this summer. Pinned–thanks! Let me know how you enjoy them! They are super simple but very delicious! Isn’t it the worst? When I had sugar for the first time in a few weeks, I woke up the next day with a horrible headache. No fun. I’m still trying to figure out what kinds of sugars and sweeteners work for me, but if you haven’t already, I definitely recommend stevia! I tried it for the first time recently and it’s pretty good! I’ve been trying to cut back on sugar as well — I eat way too much of it. I haven’t thought about how it may have any other impact it may have if I cut it out completely, but I’ve have some minor skin issues and I wonder if it would help that? Anyway, these look delicious! Thanks for sharing, stopping from SITS. I wasn’t sure if it would help, but I’d gotten to a point where I would try anything. I was definitely kind of shocked (and disappointed, ha!) that I felt so much better after taking it out of my diet. The fudge cups look delicious! These look soooo good!! I want to make them asap! The strawberry was so good. 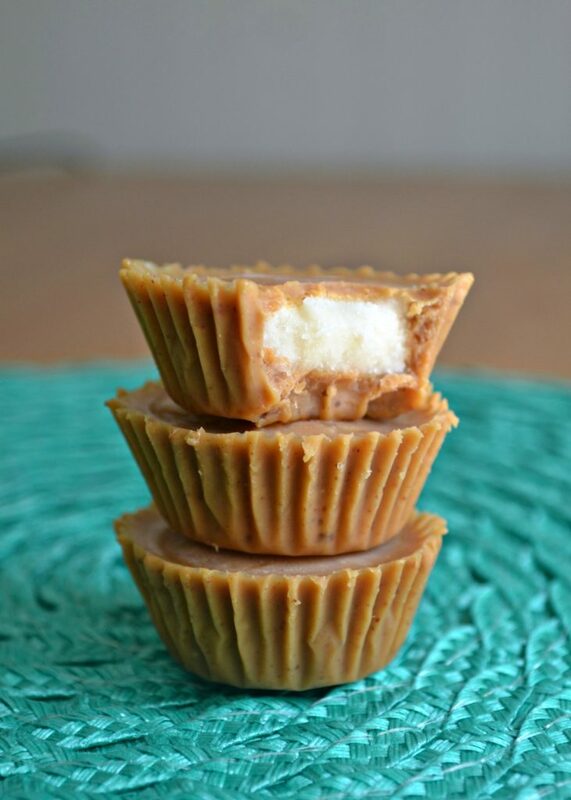 You should check out my Healthier PB Cups (linked above!) – they’re the same concept but covered in a coconut oil chocolate! So good. Love this recipe and the optional ways you have shared! Pinned and tweeted 🙂 Thanks so much for being a part of Snickerdoodle Sunday this week and sharing your posts with us. I know I am a sugar addict. I am so pleased for you that you seem to have weaned yourself off of it. I am so happy for you that you are having success with your skin issues now that you have given up the sugar. My daughter tries to really limit the amount of sugar her girls eat. This looks like a great treat. I wonder if this would satisfy my ‘sweet tooth’? I am pinning it and plan to try these out soon. Thanks so much for sharing over at the Celebrate Your Story! link party! Morgan, leave it to you to come up with the perfect solution to having your cake and eating it too…lol or having your sweets and eating them too. Or something like that! You always seem to figure out the answer to your issues, and this is perfect! I love Reese’s, but the minis have gluten in them. So I have not been able to have them, Santa and the Easter Bunny always bring them and I’ve had to sit and watch everyone else have our favorite candy! This is the perfect solution! I love ice cream with Reese’s in it, or trifle with chopped candies. This will work for all the above and it’s so much healthier for all of us!!! YEAH! You didn’t waste time at all Morgan creating delicious looking sugar free alternatives, and that is exactly what this looks like. . . SO much yumminess. I love having a secret stash of freezer goodies and these all look amazing! These look so delicious! I think I have to try them! Congratulations! This post will be featured over at Diana Rambles on Friday and has been pinned to the Featured at Diana Rambles board at Pinterest and shared on Twitter. Please grab a featured button via the post guidelines graphic. Thanks for sharing this awesome idea! Can’t wait to make these! I’m on a huge nut butter fudge kick right now! Thanks for sharing at Simply Natural Saturdays. Yes, I’m a sugar addict also and these are recipes that I need in my life. Just the thought of giving up sugar completely makes me feel faint but I could live with these. I love freezer fudge anything. Never thought to fill them with strawberry filling. Generally, no, I don’t struggle with food allergies, although I avoid quinoa, which has made me very sick on numerous occasions, and a certain brand of canned vegetable juice, which inevitably resulted in severe migraines. But I have family members with life-threatening food allergies, so I am very careful what I prepare, how I prepare it, how I clean up and what I serve to whom. These recipes look delightful and just the thing when we’re craving that little dessert after dinner. Pinning for easy reference. Thanks for sharing them! Wow. these look amazing! Thanks for sharing at you’re gonna love it!